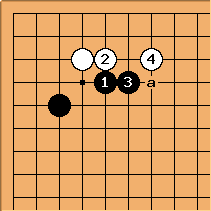 The press 3-5 joseki is prolific of pushing battle variations. After these ordinary plays, a pushing battle may occur, pivoting on the point a, either if Black plays there immediately, or if Black extends down the left side and White plays there. Assuming Black does extend down the side, is very big and also important for shape. at a is possible, even though Black seems to have weaknesses. 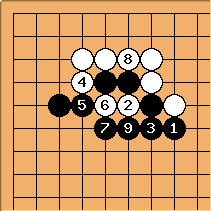 Or Black can play at b and aim to play hane in one or two moves' time. This sacrifice variation after Black's double hane gives both sides strong shape; and makes sense if Black made a long extension down the side. It is seen in recent Korean games. There is a standard variation if Black presses on immediately, to be found in books. It may lead into large-scale variations: Rin Kaiho and Sakata Eio played two spectacular games involving them in the summer of 1967. 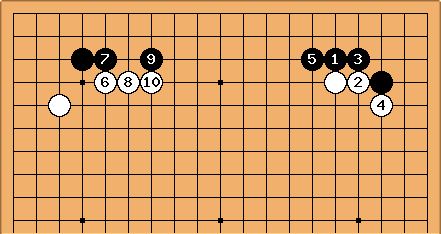 There are many tactical and timing issues, meaning that the full, approved sequence isn't often played through. 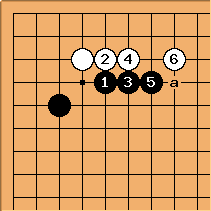 One case where the joseki sequence appeared was in a game Fujisawa Hideyuki-Rin Kaiho from 1968, with a Shusaku fuseki. 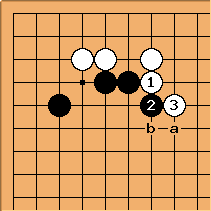 When Black chose the large avalanche with , White played and so on to keep Black in a low position. 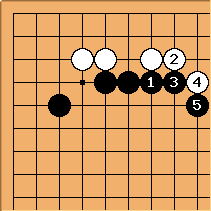 Black naturally plays double hane with , and leaves a kikashi in the corner. Both sides make orderly positions in the end. Black can think about playing at a before White has the chance of playing . In this case the focus is on the stones: is thick and keeps them heavy. 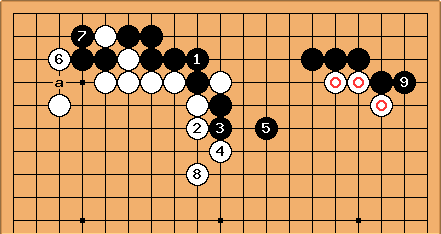 A variation that is also sometimes used in pro games is for White to hold back with and jump with here. 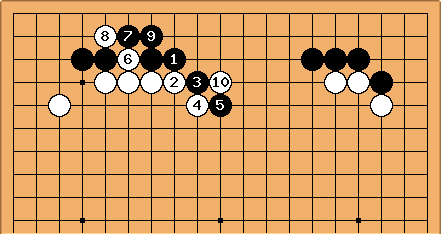 Now a pushing battle can still occur, starting with a, but both sides have better shape and the plays are less sharp and urgent.